You are here: Home » Financial Management » Is the Rich are Getting Richer, while the Poor are Getting Poorer? Is the Rich are Getting Richer, while the Poor are Getting Poorer? Why the famous statement of, “The rich are getting richer, while the poor are getting poorer” is a mathematically and economically impossible statement. Occupy Wall Street Answered! Current economic data shown by many economists and journalists out there on income inequality are plain wrong. First, let’s start by checking the famous statement of “The rich are getting richer, while the poor are getting poorer”. When you sell cars to many individuals, you will end up rich. But do you know that those people buying your cars, will end up far richer combined, than you? The answer is very simple. When they buy your cars, they use the cars to enable them to go to work, earning wealth in the process. Some turn their cars into taxis, generating wealth in a slightly different way. The data presented show that the poor aren’t getting poorer, instead, they are getting richer. Don’t believe our silly economists, they don’t even understand their own data! In our society, almost all of our rewards structure, be it in the economic sector, education or even sports are based on very stringent selection method for the winners. For example, everyone can run, but a few, can run very fast. They will be the winners in the Olympics, but 99% of the Olympics participants, do not win, and society simply disregard them and instead, rewards the fastest with generous praises, recognition and of course, medals. Fortunately, our economy is fairer than the Olympics. More just. When you do something good that add value, you will be rewarded by society. The reward process is very fair and transparent. However some of us are very good, they created things that are widely used for adding value into society, for example a light bulb, a microprocessor or a software, and they will enrich not just millions of people, but billions of people. The reward for them? Society give them a token of the new wealth created, say a few billion dollars, and give it to them (by paying for their products). Now we have billionaires, and these billionaires adds not billions into the economic wealth, but trillions of dollars! Our data showed that for every dollar created at the top 1%, seven dollars are created at the bottom. 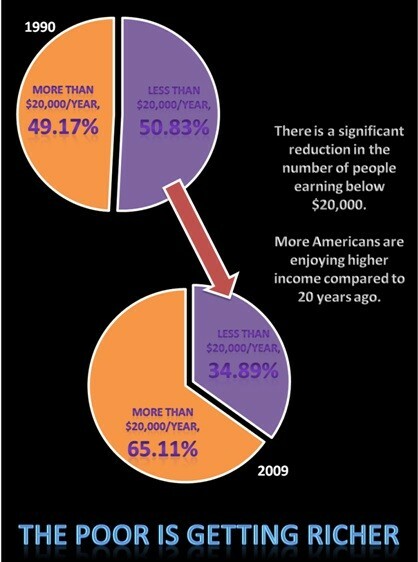 Who say the rich are getting richer? The poor are! For additional reading, please find our extensive study 259trillionvs5trillion.com website. High CEO Pay? You will understand why it is not the case, as explained below. Subtle and clever data manipulation misled the public. Think those who are rich, stays rich all the time? And the poor, stays poor indefinitely? Well, think again! Our society favors the select few, by instinct. The reason is explained below. We cannot compare the classes using the simple ‘Top 1%’ to the ‘Bottom 99%’. Find out why it is erroneous to do so. The rich, before they become one, are mostly risk takers. Even after they are successful, they would still take risks, in order to make society richer. It is no secret that the top few percent of the population paid the most taxes, compared to the rest. Check out just how much and whether there is equality and accountability in our nation finances. OWS AND NAZI—WHAT THEY HAVE IN COMMON? Find out what both have in common. Is the Nazi being reborn? Sharif Rahman is the author of this article. He was invited by 1-million-dollar-blog to write about this topic. He is the co-author of the recently released 259 Trillion Vs 5 Trillion book series (available in Amazon), presenting the banking system in action in full color illustrations and answering the popularly raised question of whether banks print money out of thin air and other questions such as exponential growth of debt and interest. Did the graph on the number of Americans paid less than 20,000 USD a year account for inflation ? If it does not, then this data is useless. Furthermore, an analysis of income-tax data by the Congressional Budget Office a couple of years ago found that the top 1% of households own nearly twice as much of the corporate wealth in the United States as they did just 15 years ago. In fact, from 1979 to 2007, average household income for the US top 1% more than tripled, while middle-class incomes grew by less than 40%, according to a new report from a research arm of Congress. To answer your question, let’s start with the IRS data. IRS publishes data using Adjusted Gross Income, where certain deductions were made using current dollars. For example, someone who made 50,000 and incur a deduction of 5,000 in 1990, and then earned 60,000 in 2009, will incur 8,000 for the same deduction due to adjustment of inflation. Therefore if we correct for inflation on the data, we will double correct for inflation. There is also a significant error if we blatantly correct any economic number for inflation. Don’t simply believe your economists, because they do not understand inflation itself. For example, how do you do an inflation correction for a car, worth $15,000 in 1990, to a car worth $18,000 today? According to inflation data, the car you’ll be buying today, should be sold for $24,600 when correcting for inflation. Yet, the car is a far better build, extremely comfortable, highly efficient with tripling or more mileage. So how do you correct for this apparent technological advancement? We explained about the problem of using inflation correction for long period of time in our Book 2 of the series. To explain why we chose the $20,000 as the cut off line between poor and the rest, it is because in 2009, $20,000 will still buy almost similar purchasing power compare to then. The purchaser also able to buy more of the things they need, with fewer corrected dollars, today. As an example, check this out, despite the price of lighting a light bulb keeps going up due to ‘inflation’ its actual costs, declined. In 1890, to light a 100W light bulb for an hour, an average worker have to work a full hour to pay for it. By 1960, the time required decreased to a mere 8 minutes. And by 1992, it was down to less than a second. To avoid any doubt, we ran an inflation corrected numbers for all of the incomes we posted above. We found those who sits at the less than $20,000 declined to 47.3% from 50.4%. Clearly, after over correcting for inflation twice, the number is still a big decline! The CBO data we found is also not corrected for inflation, as it should be. The Top 1% own nearly twice than 15 years ago. We checked this data already, please download our study at our website (it is a mini monthly publication). To summarize the jist of it, we found that the wealth increases because there are more rich people, not the rich are getting richer. Well, where this new rich came from? None other than, from those who earn less than $20,000 of course! Just a few years ago, Tan Sri Teh Hong Piow, worked as a clerk earning meagre salary. He went on to become one of the richest in Malaysia, by owning Public Bank. He was not born rich. So is Oprah Winfrey, she was from a poor family, surely earning less than $20,000 a year. Now she is a billionaire. The conclusion is, the poor is the one who is getting rich. Have a read of the complete publication, you will understand why economists data are not accurate! Finally, if the poor is getting poorer, we should be having more people in the lowest bracket, no matter there is a correction or not. It will just keep growing and growing. Poorer and poorer, they will become so poor, in fact poorer than their father or grandfathers before. Isn’t income of the poor, will eventually reaches zero given enough time? You are referring to the data by IRS of which is a flaw by itself. Please refer to Shadow Statistic. US government keep changing the items in the basket to calculate the inflation. My personal experiences tell the opposite of what you had claimed. Two years ago, my weekly wet groceries was only RM100/week and now it is RM200/week. The only change is that my only child is 3 years and 2 month old. Go read this book by Kiyosaki , Conspiracy of the Rich. I think you forget that many of the super rich 1% have gotten their wealth by corrupting the system in their favor. If I am Goldman Sachs, I can charge a corrupt government 100 times more for floating a bond that they know has money going into the hands of corrupt politicians. Goldman gets ill begotten gains, the corrupt get away with billions and the poor get left holding the empty bag. This is rampant throughout the world. Just look at the 2008 scandal in the USA. No bankers are in jail despite giving themselves bonuses while the system collapsed.